The travel offer you just sent was emailed to thousands of travel partners. Guess what? Most hit the “delete” button and never saw it. Those that did open it most likely left it in their email box never to be found or looked at again. Imagine this. You instantly email your travel offers to a network of travel agents and rather than disappearing into email oblivion, your offers are automatically stored in the travel agent’s CRM and marketing system for easy reference and look-up. 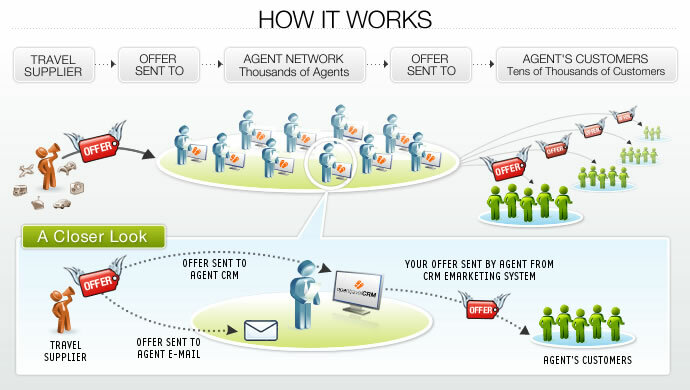 Your offers are never lost again, and are at the finger tips of agents while they are selling travel! Now, that’s a solution that works. Our new Travel Offer Network™ is a secure web based portal with an easy and fast way to upload and publish your travel specials into a growing network of thousands of travel agents using OpenTravel CRM. (OTC). OpenTravel CRM (OTC) is a web based travel agent desktop CRM and marketing solution launched in mid-September 2007. OTC has experienced sizzling growth with nearly 3,000 travel agents registered, trained and using the system to market and sell travel. An average of 50 new agents join each week.